As a public health nurse in San Antonio, Adelita Cantu has seen firsthand how the environment affects the most vulnerable members of her community. For four decades, she has worked with various county health departments on a range of programs, from providing prenatal care to low-income mothers to conducting health visits with the elderly. For the past decade, Cantu has been using her knowledge and experience to educate the next generation of nursing leaders about environmental determinants of health as an associate professor at UT Health San Antonio School of Nursing. When she learned about the Nurses Climate Challenge at CleanMed this year, she seized the opportunity to educate her students about climate change and health. For many of Cantu’s students, this is their first time examining how climate change contributes to health outcomes. But Cantu is also disappointed students don’t learn about climate change sooner, which has prompted her to give presentations on air pollution at local high schools. She especially enjoys using Nurses Climate Challenge resources to help her nursing students understand how they can make a difference by talking about climate change with their patients. Cantu recommends her students practice by talking about the issue informally with their colleagues. According to Cantu, nurses’ ability to communicate and build trust with patients can help the topic of climate change seem less overwhelming. “When I talk to nursing students or patients about climate change, I break it down and explain how can they as individuals can take simple actions to reduce their carbon footprint and how we can engage our friends and neighbors in the discussion about renewable energy,” she said. Cantu believes the Nurses Climate Challenge has tremendous potential to launch a movement of health professionals committed to climate solutions. 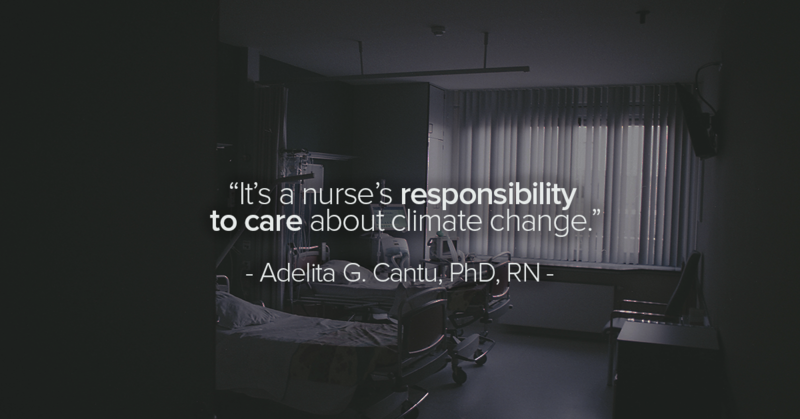 Join the Nurses Climate Challenge, and share this opportunity with your colleagues today. Adelita G. Cantu, PhD, RN, is an associate professor at UT Health San Antonio School of Nursing. She lives with her husband and three dogs in San Antonio, where she was born and raised. When she is not in the classroom or visiting with patients, she loves being outdoors and is an active cyclist. The Nurses Climate Challenge is a collaboration between Health Care Without Harm and the Alliance of Nurses for Healthy Environments. It is the first national campaign aiming to leverage the unique and trusted voice of nurses to motivate the health care sector to action.